Yesterday Alia got a few presents from Auntie Maznah. Thank u auntie! (Buat susah-susah saja..). 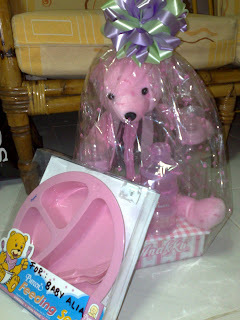 ALia got feeding bottles, a bag (the teddy bear is a bag..), and a set of baby feeding set. Oh ya, for those who doesn't know whom Auntie Maznah is, let me show you..
Ha.. This is a pic of (L-R) : Edward, Auntie Maznah and Me! Professional Development for Teachers in PKG Kuantan. And I haven't even married that time.. hahah..